Fine Art Wedding Inspiration. Many brides are gravitating towards beautiful fine art inspired weddings and this influential shoot in Ukraine captures the magic of these concepts. Delicate, dreamy, and airy are just some of the ways to describe this beautiful indoor scene. An enchanting bride and romantic florals round out this gorgeous concept. Peach and white roses are the perfect place to start. 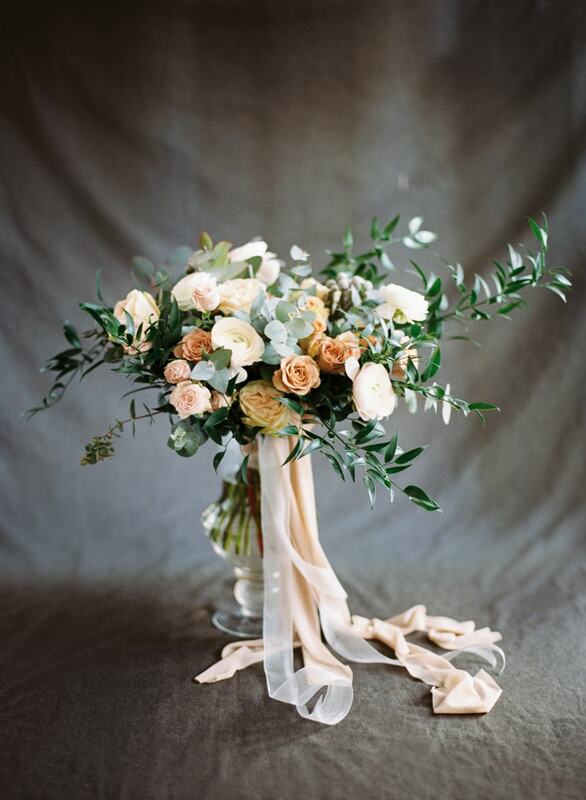 These classic blooms with their assorted greenery are tied with soft peach silk ribbons for a lovely finish. The bride has radiant auburn hair and the most captivating brown eyes. Her makeup is soft and natural and highlights all of her best features. She’s playful with the camera as she wears her hair pulled slightly back to show off the lace detail of the bateau neckline. The colors in her bouquet are an idyllic complement to her timeless lace gown. With her hair so carefree, she looks positively whimsical. The venue features gorgeous wooden floors and noteworthy architecture that adds character to the scene. The colors blend cohesively with the creative concepts of the shoot. The greenery in the bride’s bouquet stands out among the delicate colors of both the room and her gown. She holds a rose near her face, making a singular expression with one of the main inspirations and accents of the shoot. The photographer creates a double exposure with the bride’s face and a handwritten letter. The combination is raw and wistful. With the bride’s fantastic features, the photographer was able to capture many impactful shots. Whether she’s holding a flower, holding her arms, or holding her gaze, the bride gives an intriguing expression in every shot. She dons a marvelous veil that transforms her entire look. With the eerie quality of the fog behind her, she clutches her bouquet beneath the veil in a mesmerizing fashion. The veil is so long that it gathers at her feet, seemingly disappearing into a pool with her skirt. The wide shot of the veil is billowy and so romantic. Fine art can be defined many ways but when it comes to weddings, these types of inspirational shoots bring a dose of romance, sophistication, and softness that’s hard to replicate. It can be merely a moment of creativity which shapes the story of two souls hopelessly in love.